Happy 2015 everybody! Thank you to all my visitors all over the world. I haven’t been posting nearly enough as I should be, but that’s one of my resolutions for the new year. Thank you again for all your support. There’s just something so happy and exciting about Disney Magic, and Dani just can’t stop talking about Mickey’s Not So Scary Halloween Party. The weather was just perfectly suited to my taste: high in the mid 30’s (but not often) and low in the mid 20’s (mainly due to the rain, which came down 5 out of 7 days of the week). In the dead heat of sunlight, I felt particularly suffocated because I’m not a “summer person.” Plus, being pregnant, I’m always hot. I welcomed the cooling sensation the rain brought, and strolling the air-conditioned malls almost every day was fun too, not to mention the swimming pools at the Orange Lake resort complex where we stayed for the week. I shall rewind to day one and the adventures of happily married couple, adoring almost-three-year-old daughter, and 4-month-old baby swimming around in utero. Leaving home at 5:30 am, we crossed the border and arrived at Buffalo International Airport around 8:00 am. Flying out of BIA saved us at least $300-400 off typical fares out of Pearson. We also parked across the street from the airport at the Hampton Inn for $5 a day, opting to take the $2.99 cancellation insurance (if something happens and your flight is cancelled or you can’t arrive within the next 24 hours, you’re not charged a late fee). A 24-hour on-demand shuttle was ready at the door to take us over, and they provided us with a phone number to call a driver upon our return. We were very pleased with the polite and efficient service. Our first flight was to Atlanta, with a little over an hour to catch our connecting flight to Orlando. No complaints or remarks to make here, as the flights and transitions were both speedy and smooth. The first flight was under 2 hours, and the 2nd was just about one hour. Even the wait at the rental car counter was fairly quick, although I’ll heed a warning here. Car insurance for the week cost over $300, which was a surprise to us since we paid a third of that the last time we rented in Orlando. Perhaps booking your car rental separate from a flight package and opting for their insurance is the safer bet. After collecting the car seat and installing happy Dani into our black 2014 Ford Fusion (John wasn’t happy with the choice at all), we headed to Orange Lake West Village. Our room exceeded our expectations. We had used RCI exchange points to book and, listed as a Studio, it had a full kitchen minus the oven (stovetop, mini fridge, microwave, kettle, pots and pans, dishes, etc.) To save some valuable shopping/Mickey dollars, we bought groceries at the nearby Target and Walmart stores and cooked a few dinners and even more breakfasts. If you’re an Orange Lake timeshare owner, beware that you’re whisked to a separate desk to book your “return visit update” (aka Timeshare sales presentation). The incentive was 50% the resort’s play-all-week package: mini golf, use of tubes for the lazy river, etc. for one hour of your time (we didn’t even end up buying it). We dined at Ponderosa for our first evening (my how it has changed – pricey, and they eliminated the full buffet, boo hoo) and checked out some nearby stores i.e. Ross and Target, heading to bed early to recover from the 2.5 hours of sleep we had gotten the night before. We were up early to catch our 8:00 am sales presentation, which we wanted to book first thing in the morning to just get it over with. I’m extremely proud of Dani lasting the entire time, and of John and myself not upgrading or buying anything. The last time we had attended such a presentation, we walked out with a timeshare =) We had breakfast buffet at Sizzler, and after resting a bit that afternoon, headed to downtown Orlando’s Lake Eola Park. 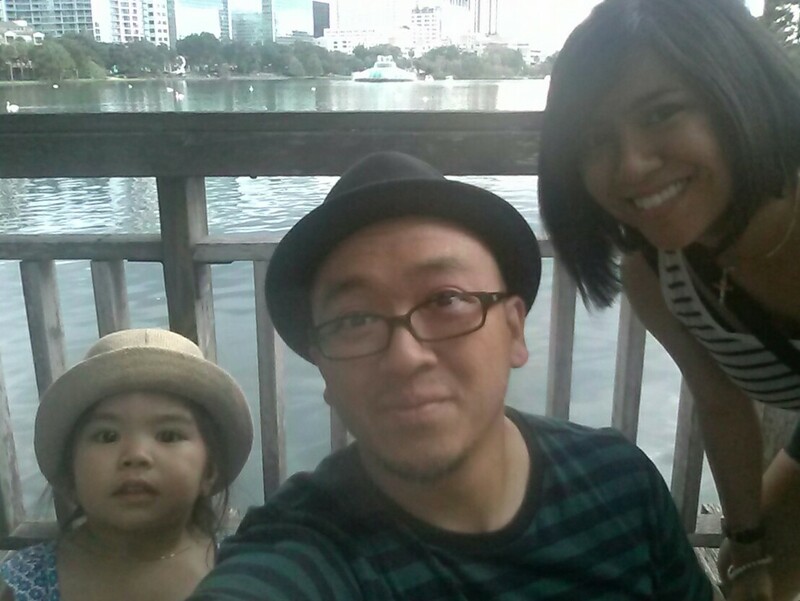 We saw some swans and plenty of baby lizards (BUTIKI! My favourite word! LOL) and did some more shopping in the evening. It was a lovely time. Dani enjoyed playing in the not-so-packable sand and wading in the waves, although she caught and swallowed a mouthful of saltwater and vomited up some mushy strawberry remains (gross). Afterwards, we headed to Toys R Us to pick up Dani’s Cinderella princess dress and the much coveted Shopkins, which were hard to find in stock back in Toronto and almost never available online. Happy reading… don’t forget to come back! Shop kings were easy to find in December. That’s what my sister said. I have no idea what it is. I hope the buffet plug pull at ponderosa isn’t chain wide. I’ll let you know in Buffalo the next time we go down. Looking forward to the continuing Florida adventures. After Christmas, they were easy/easier to find for us too! Yes, please let me know about Ponderosa. There was a buffet, but it truly was only salads, fruits, sides, and desserts. Boo.